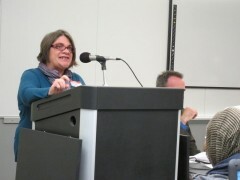 Jess Sundin tells anti-FBI repression conference: “From Colombia to Palestine, solidarity is not a crime!” | Fight Back! Fight Back News Service is circulating the following speech delivered by Jess Sundin, Nov. 5, at the first national conference of the Committee to Stop FBI Repression, in Chicago. Sundin is a leader in the anti-war movement. Her home was among those raided by the FBI, on Sept. 24, 2010. Sisters and brothers, I’m so glad to be here with you today. I’m honored to speak on the same platform with so many people I respect, whose examples I strive to follow. Not only my friend, Carlos Montes, but also the speakers you will hear later – the families of political prisoners from the Palestinian struggle – Sami Al Arian, Ghassan Elashi and Abdelhaleem Ashqar. These men, like Carlos, have dedicated their lives to the liberation of their peoples and making this world a more just one for all of us. We are here today because the powers that be will do anything to silence voices for justice. U.S. imperialists have bombed out whole cities, killed, tortured and starved millions of people - all in the pursuit of power and profit. We are here today as those who have raised our voices to oppose imperialist wars. We have organized our communities to stand in solidarity with the oppressed, those directly in the crosshairs of the imperialist war machine. And yet, they dare to call us the terrorists, to treat us as the criminals. But turning reality on its head cannot save them as their grip on the world slips every day. From the Arab uprisings to Occupy Wall Street, and all points in between, the war criminals are losing ground. They cannot control the will of the peoples of the Middle East or South America, so they make criminals of those here in the U.S. who support self-determination for the world’s peoples. I visited Iraq in 1998, after then-Secretary of State Madeleine Albright told the world that U.S. policy objectives were worth the cost of half a million dead Iraqi children. Since then, I have known that the U.S. government would do anything, pay any price, to clear the way for their agenda. When the FBI burst through my front door last September, this knowledge became very personal. That was the beginning of an open campaign of repression that has ensnared 24 of us in a government investigation of material support for terrorism. The law banning material support criminalizes work that has been done by countless movements for decades – the struggle against apartheid in South Africa, support for the Irish Republican struggle, the Central America solidarity movement and many more. If this kind of work is illegal, then sign me up for some civil disobedience! Joking aside, we cannot allow the government to criminalize this very important work. To defend us, is to defend every acts of international solidarity. The search warrant for my home authorized the FBI to seize any correspondence with anyone living in Colombia or Palestine; anything about travel to Colombia or Palestine, or anywhere; address books and phone lists; anything about the Anti-War Committee and much more. After five hours of searching, eight FBI agents seized several boxes of political and personal material, mostly paper, that might only offer evidence of who I know or what I believe. They left my partner and I each a subpoena to appear before a grand jury here in Chicago. As you know, we, like all the others in our case, refused to testify. The decision was easy - none of us would ever agree to testify, betraying our friends and colleagues, the organizations we have helped to build and the movements we have worked in solidarity with. At the same time, we knew the government could punish us for this decision – as they have done to Drs. Ashqar and Al Arian, whose stories we will hear later. Several of us made custodial arrangements for who would care for our young children, should the government choose to jail us for refusing to testify. So far, your work has protected us from the contempt charges that have imprisoned others. We know the government could change course at any time, but still we will not testify. You may have read that some of our property was finally returned last week, after more than a year! While it’s certainly nice to have our copy of the Anti-War Committee database, or our copy of the petitions people signed to end U.S. military aid to Israel, it makes me sick that the FBI has digitally copied everything they took from all of our homes and offices. Literally, as I unpacked the boxes, my stomach turned with each item that had someone else’s name and number on it, as I imagined them being caught up in the FBI’s net. That the government can come into your home, without even a criminal charge against you, take whatever they want, keep it for a year, and keep their own copy forever, is such a violation of our most basic civil liberties. So for me, the return of my property is not a cause for celebration. Instead, it makes this all much more ominous, as I imagine decades of my work now being stored in FBI databases, to use however they wish. Some of you may also be aware of the FBI’s own secret documents, mistakenly left behind in one of our homes last September. If you haven’t seen them yet, you can find them on our website at stopfbi.net. The documents were the FBI’s operations plan for Sept. 24. They outline a plan for a highly-militarized assault on a one bedroom apartment above a restaurant in Minneapolis. Hundreds of rounds of ammunition, hand guns and automatic rifles, snipers, a hostage negotiator, directions to the nearest trauma center- it goes on and on. We don’t know what was planned at every home they raided on Sept. 24, but I know they were poised with a battering ram, when my partner and then-six-year-old daughter opened the front door of our home. Some 70 agents were involved in simultaneous raids in Minneapolis and Chicago, as well as questioning our colleagues from North Carolina and Michigan, to Milwaukee and San Jose. The operations plans reveal that six different FBI field offices are involved in this investigation. The documents also include more than 100 interview questions they hoped to ask, if any of us had volunteered to talk while they were raiding our homes. Some of them were for everyone, and some were individual questions. One sister was asked about her husband’s immigration status, another was to be asked, “Did you ever recruit anyone to go to Israel, the West Bank, or Gaza?” They were going to ask me if I had ever lied to a grand jury. But most of the questions, to be asked of everyone, read as if they had been pulled out of a dusty old file from the McCarthy era: “Have you ever heard of Freedom Road Socialist Organization? Who are the leaders? Who are the members? What is discussed at meetings? Does anyone take notes? Where are those notes?” and on and on and on. Freedom Road is an open organization – with a website and a newspaper, and people like me who are known, public members. The U.S. constitution guarantees the right to freely associate with like-minded people. Between the economic crisis at home, and the brutal wars abroad, it is no wonder that some people are looking for an alternative to capitalism, and for us in Freedom Road, the alternative we advocate is socialism. It is not a crime to be a socialist, any more than it is a crime to be a Palestinian or a Muslim. But the government wants to prosecute us for our thoughts, thought crimes. You know what? I do oppose the policies of the U.S. government, a fact I have been very public about. I have organized marches of 30,000 to say no to the wars in Afghanistan and Iraq. I have spoken out about the humanitarian crisis I witnessed in Iraq, created by sanctions and war. I have hosted women trade unionists from Colombia and Palestine, to tell people here about the impacts of U.S. policy on their peoples. I have written and spoken about my trip to Colombia, where I met with FARC guerrillas who were at that time, engaged in a peace dialogue with the U.S.-backed Colombian regime. I think this country is run by criminals who place no value on human life. Shame on them for accusing me of terrorism, as they carry it out every day in countries across this globe. But to clear the way for more new wars abroad, and more attacks on people here at home, they are doing just that. And for me, the stakes could not be higher. If every protest I have organized, every trip I have taken, or helped others take, every time I have spoken in support of self-determination for oppressed peoples, every dime I have helped to raise for daycares in Palestine; if each of these is a count of material support, each punishable by 15-year sentences, then I face the rest of my life in prison. Yes, I will fight these charges in court, but the real battle will be won or lost on the streets, in the political realm. We need a broad base of support and massive public outcry to compel the prosecutors to close this grand jury without indictments. We know that grand juries are basically indictment machines. If the prosecutors aren’t persuaded to drop this case, some number of us will face very serious charges. I thank you for the work you have already done. We are relying on you to keep the pressure on, to raise funds for our defense and to continue the important work of international solidarity.